This is the season for having friends and family over. Something about Christmas encourages us to open our hands and hearts to those around us. Every year I think about putting together a Christmas Party though last year was the first time I actually did something along those lines. I hosted a Cookie Swap last year, and it was a lot of fun. This year though I am hoping to have a small dinner party with a few close friends. Perhaps you always have good intentions as well? I often just need a bit of a nudge, so just in case that is you here is yours from me! Earlier this year I took some time to create some Christmas Party Invitations in hopes that it would encourage me to use them. Possibly you could use them too? Christmas Parties do not have to be elaborate affairs, simply opening your home to friends and/or family for dinner or even dessert with games is a great place to start! Sometime in the future I hope to have an elaborate Christmas Party, but not for me, family or friends. My dream is to work with the Foster Care Kids in Maine in hosting a Christmas Party for them. It would be complete with a beautiful tree, stockings, presents, cookies, treats and the true CHRISTmas story! A perfect time for little girls to wear beautiful velvet Christmas dresses and boys to run around with new toys! Remember earlier this year when I wrote about never having enough time to fulfill all of my dreams? This is another one that is just waiting for God’s perfect time. 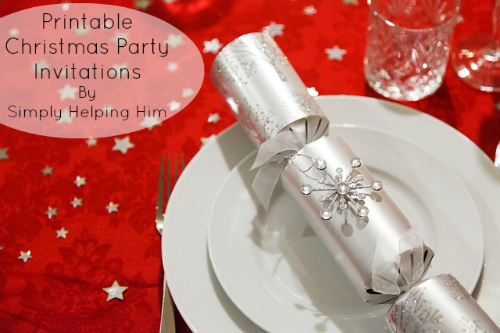 So however simple or elaborate your Christmas Party is this year, I pray that it will be filled with love, peace and remembrance of Christ’s birth and love for us. 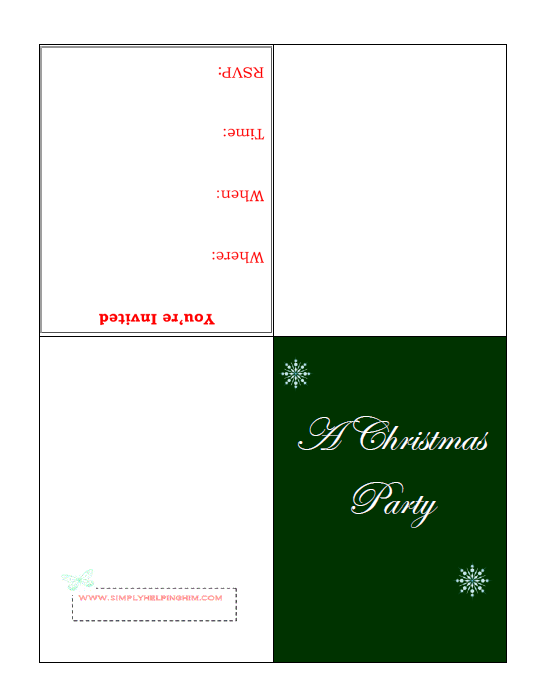 Should you be interested in printing some Christmas Party Invites like the one (including a few different designs) pictured below, simply follow this link. Another Christmas printable you might be interested in is the Stocking Gift Printables for Hubby, here are some Christmas penmanship printables too. Thank you for hosting the link up! Blessings!